Mercedes-Benz India will launch the GLE 450 AMG Coupé on 12 January, 2016 in Mumbai. Kickstarting Indian operations for 2016 will be the GLE 450 AMG Coupé for Mercedes-Benz, after as many as 15 launches in 2015. The GLE Coupé is Mercedes’ answer to the BMW X6, the quintessential four-door coupe-crossover. The GLE Coupe, based on the GLE (ML replacement) has a similar body style, with a sloping, coupe-like roofline that doesn’t concur much with the high-riding stance. 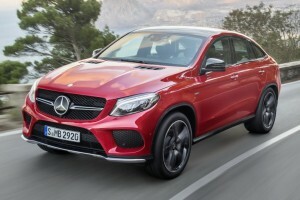 While the GLE Coupé is available internationally in 4 variants, India will get the semi-sporty 450 AMG variant, the first Mercedes to feature the AMG Sport badge, a halfway house between the regular variants and the full blown AMG variants. The Mercedes-Benz GLE 450 AMG Coupé is powered by a 3.0-litre, V6 biturbo petrol engine, good for 362bhp, and 520Nm. The engine is mated to a 9-speed automatic transmission, which comes with a dynamic select variable control system which provides five different driving modes – Individual, Comfort, Slippery, Sport and Sport+. 2016 Mercedes-Benz E-Class Official Pictures Leaked!